PORTLAND, Ore. — A new study finds that a self-guided, 12-week program helps binge eaters stop binging for up to a year and the program can also save money for those who participate. Recurrent binge eating is the most common eating disorder in the country, affecting more than three percent of the population, or nine million people, yet few treatment options are available. But a first-of-a-kind study conducted by researchers at the Kaiser Permanente Center for Health Research, Wesleyan University and Rutgers University found that more than 63 percent of participants had stopped binging at the end of the program — compared to just over 28 percent of those who did not participate. The program lasted only 12 weeks, but most of the participants were still binge free a year later. A second study, also published in the April issue of the Journal of Consulting and Clinical Psychology, found that program participants saved money because they spent less on things like dietary supplements and weight loss programs. Binge eating has received a lot of media attention recently because the American Psychiatric Association is recommending that it be considered a separate, distinct eating disorder like bulimia and anorexia. 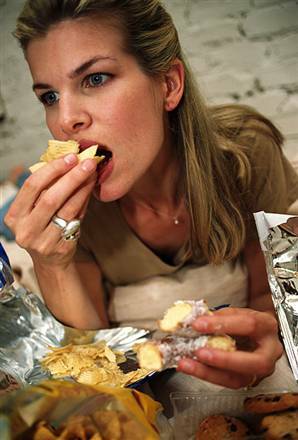 This new diagnosis can be expected to focus more attention on binge eating and how best to treat it, according to the researchers. It also could influence the number of people diagnosed and how insurers will cover treatment. This randomized controlled trial, conducted in 2004–2005, involved 123 members of the Kaiser Permanente health plan in Oregon and southwest Washington. More than 90 percent of them were women, and the average age was 37. To be included in the study, participants had to have at least one binge eating episode a week during the previous three months with no gaps of two or more weeks between episodes. Half of the participants were enrolled in the intervention and asked to read the book “Overcoming Binge Eating” by Dr. Christopher Fairburn, a professor of psychiatry and expert on eating disorders. The book details scientific information about binge eating and then outlines a six-step self-help program using self-monitoring, self-control and problem-solving strategies. Participants in the study attended eight therapy sessions over the course of 12 weeks in which counselors explained the rationale for cognitive behavioral therapy and helped participants apply the strategies in the book. The first session lasted one hour, and subsequent sessions were 20–25 minutes. The average cost of the intervention was $167 per patient. All participants were mailed fliers detailing the health plan’s offerings for healthy living and eating and encouraged to contact their primary care physician to learn about more services. By the end of the 12-week program 63.5 percent of participants had stopped binging, compared to 28.3 percent of those who did not participate. Six months later, 74.5 percent of program participants abstained from binging, compared to 44.1 percent in usual care. At one year, 64.2 percent of participants were binge free, compared to 44.6 percent of those in usual care. Everyone in the trial was asked to provide extensive information about their binge eating episodes, how often they missed work or were less productive at work, and the amount they spent on health care, weight-loss programs and weight loss supplements. Researchers also examined expenditures on medications, doctor visits, and other health-related services. The researchers then compared these costs between the two groups and found that average total costs were $447 less in the intervention group. This included an average savings of $149 for the participants, who spent less on weight loss programs, over-the-counter medications and supplements. Total costs for the intervention group were $3,670 per person per year, and costs for the control group were $4,098. “While program results are promising, we highly encourage anyone who has problems with binge eating to consult with their doctors to make sure this program is right for them,” said study co-author Lynn DeBar, PhD, clinical psychologist at the Kaiser Permanente Center for Health Research. Study authors include: Lynn DeBar, John F. Dickerson, Frances Lynch and Nancy Perrin from the Kaiser Permanente Center for Health Research in Portland, Oregon; Ruth H. Striegel-Moore and Francine Rosselli from Wesleyan University; G. Terence Wilson from Rutgers, The State University of New Jersey; and Helena C. Kraemer from the Stanford University School of Medicine.